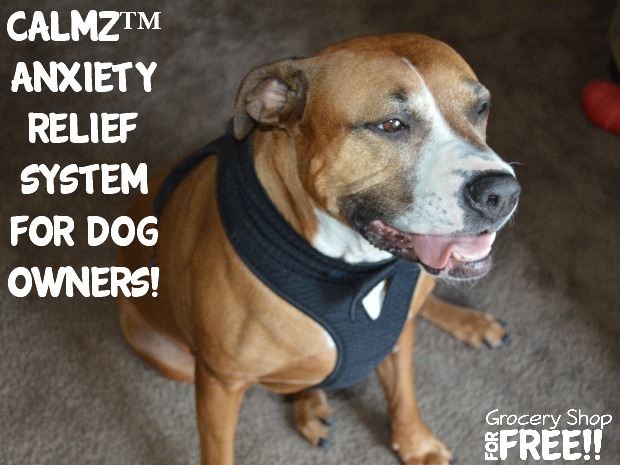 Calmz™ Anxiety Relief System For Dog Owners! You are here: Home / Sponsored / Calmz™ Anxiety Relief System For Dog Owners! I was asked to try out the Calmz™ Anxiety Relief System for our dog Molly. We got Molly several years ago from the shelter. We went looking for her, as we had seen her online. If it worked out this was Bear’s birthday present that year. So, we got to the shelter and in our local shelter the holding pens are brick up about chest high and then glass above that. All of the dogs were jumping up at the windows and barking. All of the dogs were all in separate pens, and there were a lot of them. A huge room full of these pens, so it took a while to walk around looking for her. None of them seemed to be her and we thought maybe she had already been adopted. Just as we were about to give up, Bear ran over to one window where there was no dog to look in. Well, there was a dog, Molly (as we later named her). She was laying on the tile floor, because she was afraid of it (we later found out she was afraid of everything), she wouldn’t walk on the floor at all. They had to carry her to us in the “visiting” area so we could play with her. She weighed about 50 lbs, she was no puppy! But, she was terrified of the barking and the floors and everything. Once we got in the closed in area and they brought her in, she RAN to Bear and laid her entire front half of her body in his lap. She had no time for Hubby or I, just Bear! From that moment on they were inseparable. The vet guessed she was about 2 when we got her and that she had maybe been abused as she was scared of everything. He said she was a Pit-Boxer. She is GORGEOUS and LOVES to play! But, once we got her home we saw how frightened she was of the smallest things. I spent 30 minutes one day walking her, on leash, through the French Doors we had that led to the backyard. They terrified her, so in and out, in and out, over and over and she finally saw it was ok. There were many things like that, and for the most part, she is over all of that and feels secure. Until last year, on the 4th of July when Bear took her for her nighttime walk and someone set off fireworks and she heard them live! She DRUG him back home running as fast as she could. He said she almost pulled him down. So, we make sure we keep her in the house at those times of the year when there might be fireworks. They don’t seem to bother her if she is in the house. She loves kids and well.. she loves EVERYONE and wants to play with everyone. So, when the grandkids come over or the older boys come visit, she is all in their face. They older boys can take it, but with the younger ones, she’ll end up knocking them down running past them wanting to play or WHIP – and I mean WHIP them with her tail by accident. The toddlers are just at the right height to be caught by her tail, sometimes in the face – OUCH! So, later that day our Daughter came over and had the kids with her and we put the Calmz vest on her and turned it on, and she stopped bouncing around pretty much right away. She relaxed and laid down and watched the kids play! Normally she would be right smack in the center knocking toys over and licking babies! lol She was calm and content to just lay nearby and watch them play. We were shocked, and pleased! Normally she would be hanging over his shoulder and licking him or trying to get him to run and play! But, she is perfectly calm and relaxed when he is this close, it’s really amazing, if you knew her! 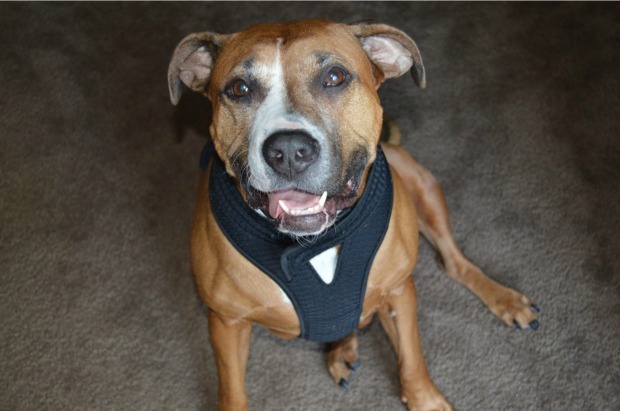 The Calmz™ Anxiety Relief System for dogs consists of an adjustable vest that cradles a device over specific acupressure points on your dog’s spine. When the device is activated, the clinically proven NeuroSync™ Technology takes over. Your dog will hear and feel a therapeutic melding of classical music, tones and vibrations that soothes anxiety within minutes. 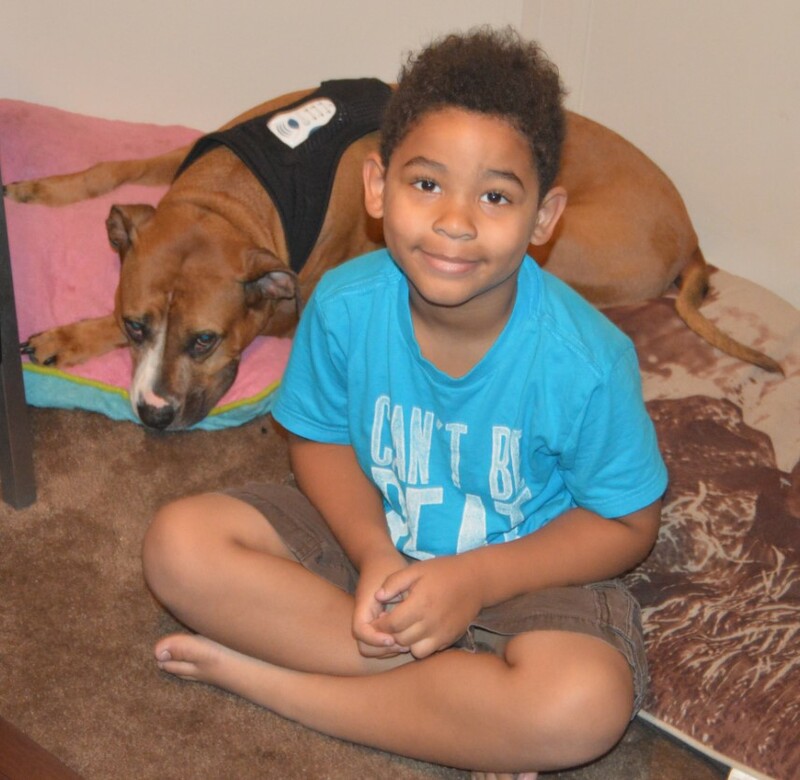 If you have a dog that is suffering from nervousness or anxiety, do them and you a favor and get this – you won’t regret it, we are thrilled with it!